Coral degradation has cascading effects on marine life, fishing livelihoods, food security, natural infrastructure, and nearby tourism, threatening coral’s $2.7 trillion USD annual valuation of its ecosystem services, according to the International Coral Reef Initiative. Red Sea reef. Photo via Adobe Stock. The Marine Conservation Institute reported that only 2.8 percent of the ocean is protected today. This is far from the 20 to 30 percent recommended by International Union for Conservation of Nature as necessary to safeguard marine life. That would require $18.8 billion USD per year, according to a 2004 research paper from University of Oxford. Yet only $1.9 billion USD has been committed toward coral conservation between 2010 and 2016, UN Environment reports. 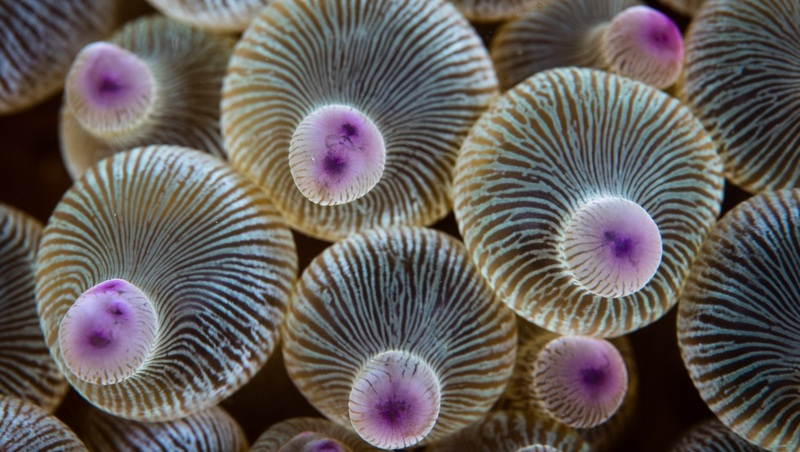 Clearly, coral ecosystems are intrinsically linked to the global economy. A future without reefs will make the seafood market plummet. They will also cause massive losses for real estate developers and investors and a dramatic decline in tourism. It is therefore in the best interest of market systems to support coral restoration. 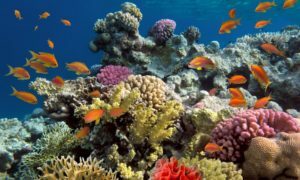 Key players spurring action in coral financing and restoration in the face of this crisis are Swiss Re, Coral Vita, Blue Finance, and GRID-Arendal. 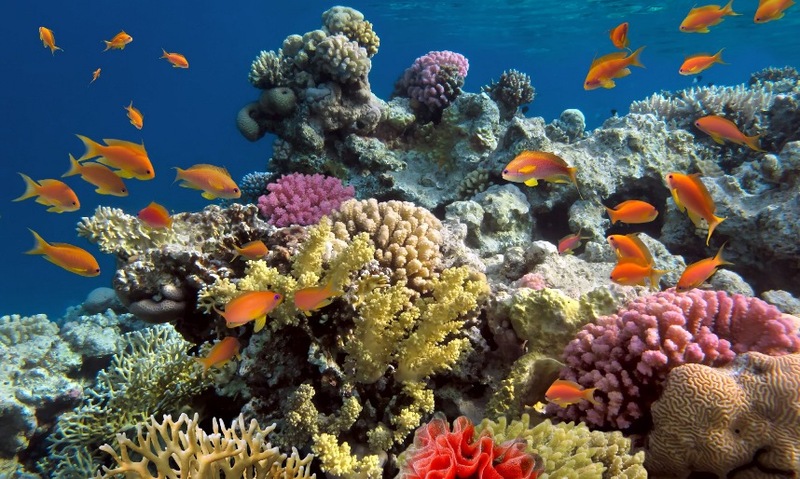 Swiss Re is a global provider of reinsurance and a pioneer in parametric insurance for coral, having recently supported the Mesoamerican Reef on the Mexican coast. This parametric insurance scheme, done in partnership with The Nature Conservancy, is distinct from traditional insurance. Rather than compensating for the loss of coral, the fund makes payments for the immediate replanting and restoration of coral in the event of a hurricane. Hotels are key beneficiaries of the natural barrier provided by healthy coral that protects coastlines and beaches. As such, hotel operators are the primary contributors of premiums to this insurance scheme. Coral Vita is a for-profit organization restoring threatened reefs by growing and transplanting resilient coral. It is the first privately held, land-based, commercial-market restoration company to have successfully raised a seed round of $1.1 million USD from a mix of conservationists, investors and incubators. Blue Finance is an intermediary organization that designs and implements financing mechanisms for marine ecosystems. GRID-Arendal is a Norwegian foundation working closely with UN Environment to support Blue Finance in its engagement with stakeholders. These are some trailblazing initiatives being undertaken in coral restoration today; maybe more will follow. Reef in Bonaire. Photo via Adobe Stock. Investors in conservation are often deterred by misaligned risk and return profiles, long investment timelines, and poor investment comprehension. Indeed, private sector understanding of ecosystem services is vital to the restoration economy. With that information, Swiss Re modeled the impact a reef could absorb during a storm event. Without reefs, the storm “would theoretically destroy the beach – and beaches are obviously the life blood of hotels,” Kaplan said. Making this link clear to stakeholders is vital to the success of this mechanism. There is a strong need to apply novel financing mechanisms and business models to prevent the catastrophe facing coral. Kaplan said there may be further innovation going forward. “I believe we will start to embed predictive capability into the insurance mechanism to prevent loss from occurring in the first place.” Swiss Re is already applying this to livestock in Kenya using satellite technology to predict when cows are at risk of dying from drought, enabling farmers to take pre-emptive action. Such innovations have not yet been integrated into donor support. For example, the recent $443.3 million AUD federal grant to the Great Barrier Reef Foundation epitomizes the traditional mode of funding. Perhaps innovative financing mechanisms are better suited for the purpose of leveraging greater private-sector capital and reducing the burden on public-sector funding. Through new business models, innovation is about finding unique ways to fill market gaps. According to Teicher, “What’s different about Coral Vita is its use of land-based coral farming.” Traditional projects are small-scale and done underwater, limiting species diversity. This also puts species at greater risk during storm events. In contrast, Coral Vita can grow more resilient coral 50 times faster on land than underwater. However, large upfront costs deter nonprofits from pursuing similar models. This shows the advantage of private investment received by Coral Vita. Bryan said there are other possibilities to achieve scale via financial mechanisms. With blue bonds, the difficulty lies with the high dollar amount, which makes it difficult for marine-conservation projects to pay the money back. The $15 million USD sovereign blue bond by the Republic of Seychelles sets a precedent in addressing this difficulty through the provision of grants and concessionary loans to eligible businesses in their early years. Smaller mechanisms like public-private partnerships have a higher potential for success because they “are very hands-on and there is a lot of valuable interaction between players,” Bryan said. Bulbed Anemone tentacles. Photo: Adobe Stock. This opens opportunities for “large-scale, meaningful, high-impact projects that not only protect the environment but also create jobs and realign the way money is spent so that it is more equitable,” Teicher said. For example, Coral Vita plans to invest further in research and development with the purpose of integrating technological innovation within coral restoration as they transition towards larger scale coral farms across the world. “Very quickly, there will be a tipping point where [conservation investments] become a norm,” Bryan said. 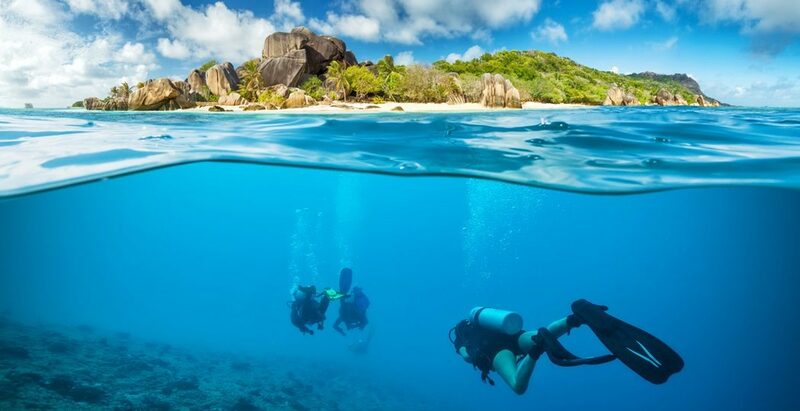 Featured photo of divers in the Seychelles via Adobe Stock. This article by Kalyani Basu originally appeared November 27, 2018 on the website of the Conservation Finance Network, a partnership of the Yale Center for Business and the Environment, The Conservation Fund and Island Press, with financial support from The Nature Conservancy. Reprinted here with permission.